Dante can swim. Ari can't. Dante is articulate and self-assured. Ari has a hard time with words and suffers from self-doubt. Dante gets lost in poetry and art. Ari gets lost in thoughts of his older brother who is in prison. Dante is fair skinned. Ari's features are much darker. It seems that a boy like Dante, with his open and unique perspective on life, would be the last person to break down the walls that Ari has built around himself. But against all odds, when Ari and Dante meet, they develop a special bond that will teach them the most important truths of their lives, and help define the people they want to be. But there are big hurdles in their way, and only by believing in each other – and in the power of their friendship – can Ari and Dante emerge stronger on the other side. Oh, I wanted to love this book. Not just like it, but love it, the way most other people seem to. But I ended up just liking it. I like it in an above-average way (I did give it 3.5 stars! ), but I don't love it. I found that I sort of loved aspects of the story in isolation from the story itself, if that makes sense? But the story itself – I just liked it. Part of the problem for me was the writing style. It made me feel so detached from the story, like I was watching everything take place through a thin gauze. I didn't feel much of anything. Ari, the narrator of the story, spends most of the book hiding from his feelings. I don't know whether it's a good thing or a bad thing that I felt hidden from his feelings too. I just felt completely distant from the story. Plus, a lot of the story consisted of dialogue, and I felt that the dialogue was quite stylised? It didn't always feel very realistic to me, but that's probably a deliberate choice on the part of the author. One that didn't quite work for me. The dialogue didn't have a lot of dialogue tags either. The long conversations of short sentences exchanged by Ari and Dante were sometimes confusing to read as the whole conversation would go by with nary a tag in sight. I kept losing track of who was speaking and having to go back to the beginning of the conversation to work it out. Because the writing style just wasn't my thing, I had to abandon the book for a few weeks after reading the first 100 pages because I just... I wasn't immersed at all. (I started reading this for the LGBT April Read-along, oops.) Even though I could tell that with a different writing style, this story would have completely blazed with life for me as a reader. I know that lots of other people adore this book, so this is probably a very personal complaint. But yeah. I love so many things about this story. I love Ari and Dante as characters, I love their character arcs and their individual struggles, I love their friendship, I love the lengths Ari would go to for Dante. I love their parents. This was hands down the best aspect of the book for me – one of the most amazing portrayals of parents I've come across in YA. Their parents are just such individuals! They're all characters in their own right, and the story is very much about Ari learning to see his parents as people. Humans who bear sadness just like he does. This is something that I would like to see happen more often in YA. Seriously, Ari's character arc is so good! I love how much he develops over the course of the book, how he begins to reach out more to his father, how he lets himself start to think about and eventually talk about his brother, who is in prison and whom nobody else in the family ever talks about, and how he finally confronts his own feelings. But I just don't feel what he's feeling as a reader, and that sucked. Ari and Dante's friendship was beautiful though. Ari was so brave and unhesitating when it came to protecting Dante. And I love how Dante taught Ari to examine his own life and open up to the world. Thanks for telling us about the writing style. Will probably read a few chapters at the bookstore to see if I'd want to buy the book. Hopefully you'll like it! The content of the story is so meaningful and beautiful, that even though the writing style didn't work for me, I still liked the book a lot. I have my eye on this book. I think I'll also have some problems with the writing style, because I like to be immersed and completely engaged when it comes to reading. However, I do love it when parents are actually given full personalities! It's rather rare to see in other YA books. (I find it that readers who like fantasy the most, don't enjoy this as much as others...) I don't always like lyrical writing, but it worked for me in Ari and Dante. It was a good book! Just not the kind of book that makes it onto my favourites shelf. 3.5 stars is still a great rating by my standards (I really liked Grasshopper Jungle and that only got 3.5 stars from me). I'm still glad I read it, and like I said, I loved many aspects of it. I just couldn't love the work as a whole. Hmm, I wonder why people who love fantasy don't enjoy this as much? I mean, I like realistic fiction too and read plenty of it. But with Ari & Dante I just feel like the writing style made me feel like I was wandering aimlessly around in endless white space. It was really weird. I just felt so disconnected to the story. Still, I want everyone to LOVE this book. But even if you didn't love the writing, you did love Ari&Dante and their parents so you're "forgiven". Haha. Aww I'm sorry this wasn't amazing for you :/ I'm one of those people that LOVED this book, but I think you're right, that it just depends on how much you connect with and like the writing style. I tend to kind of like lyrical-y stuff, so I'm not surprised that I adored this book, but it's definitely not something for everybody. 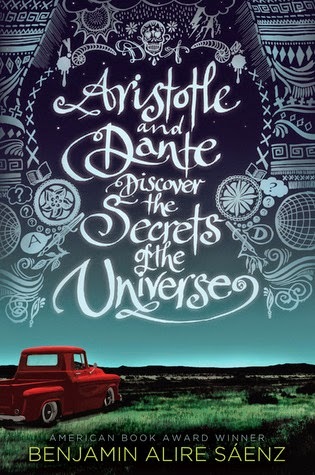 One of my favorite parts about this book was how strong Ari and Dante's FRIENDSHIP was, too. Like I know that it's an LGBT book, but most of the book is more centered on them just being friends and I really, really liked that. M/m friendships aren't often explored in YA that much...and especially to this detail. It was something that I really appreciated and enjoyed about this book a lot. The thing is, I tend to like lyrical stuff! I really do! I'm baffled as to what happened with this book. But yeah, Ari and Dante's friendship was beautiful. I would have been fine with it even if they weren't in love with each other, tbh. Well, I, unlike most fantasy readers, don't actually care much for plot? Give me good characters over good plot any day. I can actually enjoy really pointless slice-of-life stuff and also long and slow and meandering novels where nothing much happens (some of my favourite books in fact are like that), so idk. Ari & Dante is a puzzle to me. I know what you mean about the style. It's very... I don't know, different? I was worried at first that I would have trouble with it. But there was something about the story thazt just kept me reading. And then I fell in love with all the characters. The parents! Oh my gosh, I LOVED how involved they were! Such a beautiful array of relationships! And that quote! Oh my god, I love that quote! I had a very personal response to that quote, but even without that, isn't it so beautiful? Ugh! So much to love with this book! But I can understand why you felt distanced from it. Great review!